Dance Commentary by Heather Desaulniers: "Night Falls"
Dance theater combines story and movement together in a theatrical expression. Dance used in this field exists on a spectrum, ranging from codified modern and ballet vocabulary all the way to very minimal physicality. While a very broad genre, all dance theater shares two requirements: integration and necessity. First, the story and movement must make sense and work together. And second, each entity must make unique contributions and have its own reason for being. This delicate balance is incredibly difficult to accomplish. "Night Falls", the new work by Julie Hébert and Deborah Slater, brilliantly captured the first goal - the movement and the narrative were definitely a cohesive unit used in combination to express the text. The choreography was a gestural interpretation of the words, serving an emphatic purpose. However, with respect to necessity, "Night Falls" missed the boat. The miming actions worked as emphasis and were well-integrated into the piece, but they lacked their own distinctive purpose. Unfortunately, the choreography came off as a mere accompaniment. 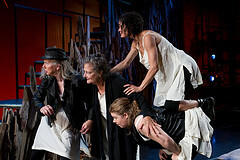 "Night Falls" was a merging of memory, fantasy and self as a woman (Peregrine, played by Joan Schirle) deals with the reality of her sixtieth birthday. As told through the intersection of her different-aged selves, we come to understand her fears: of getting older; of being vulnerable; of being humiliated; of being alone. By referring to her various life experiences, the younger and older versions expose Peregrine's inability to be wrong, to follow through, and to ask for help. "Night Falls" is a true coming of age story with significant depth and relatability. As stated, the choreography served the text by creating an obvious physical embodiment of the spoken word. For example, when the actors told of rain or stars, the hands went overhead and fingers moved in a typing motion. As the story called for expressions of defiance, feet were stomped, arms thrown and fingers pointed. Scattered discombobulation was indicated with frenetic shaking. While very clear, the movement just wasn't needed to propel things forward. In fact, I found the use of gestures to be distracting at times. Hébert and Slater's story is great and the acting was phenomenal on Friday - "Night Falls" can stand on its own. Less really does say more. I think this works more as a play than a dance theater piece; check it out and see what you think.